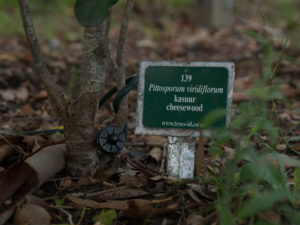 One of the features of this exercise was the complete replacement of the drip system watering young trees in the tree copses along the concrete pathway. To ensure consistent water pressure at each of the watering points, the 20 mm black feeder pipes, now buried, were replaced in a ring configuration in each copse. 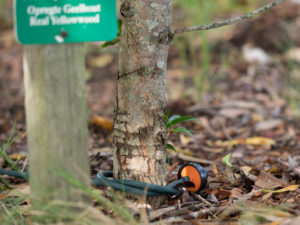 This will ensure that each of the watering nozzles connected by the smaller “spaghetti” pipes, feeding individual trees, receives an equal quantity of water. 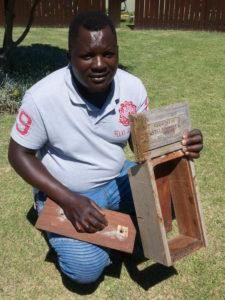 Work on the irrigation system was delayed for a while due to a bee hive that had settled in the valve box north west of the indigenous gardens.Thanks to the prompt response from Owen Williams, the owner of Honeychild in Rheenendal, the bees were safely removed and the work on the irrigation system continued. The hive has been resettled on a nearby farm. Curious bees inspecting their new home. 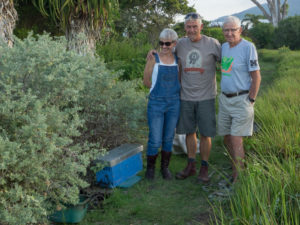 Christa Le Roux, Owen Willams and Roger Voysey. 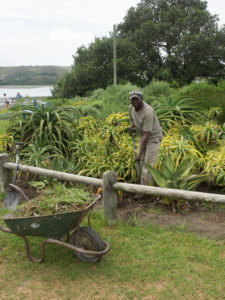 Thanks to Ivy Garden Services for the work done along the footpaths in the indigenous gardens. 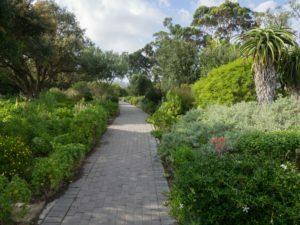 It is now easy to meander along the cleared paths, admiring the Autumn flowers and take a few close up photos of the Helichrysum foetidum in full bloom. Ivy garden services have also done an outstanding job clearing the overgrown bushes along the paved pathways. Enjoy the colorful views while walking in this area. Thanks to Jonny Nlyirenda (below left) and Michel Mandeya (below right). We are very fortunate to have these two enthusiastic guys helping with the upkeep of our gardens, benches, and pathways. Jonny works in the gardens over the weekends. 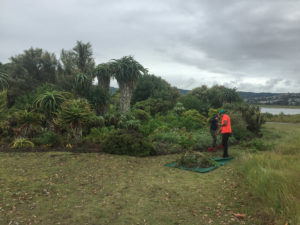 Michel has varnished all the faded benches, is repairing all the damaged dog poo bag boxes, and is also re-laying any loose bricks along the pathways. Michel also empties poo boxes and litter bins every weekend. Varni, one of our guards helps out with dog poo pick ups along the pathways. As you walk by, please give these guys a smile and a word of encouragement.